It also a question of logistics. The resources for environmental monitoring – the equipment, the expertise, the money – are not evenly distributed around the world. While scientists do choose field sites based on ‘science,’ we also have to weigh the optimal locations for answering key scientific and societal questions against the infrastructure available and the basic ability to complete research in those locations. No funding agency will support a project unless you can show that it is feasible. The more comprehensive observed database cannot fill the gaps where no monitoring occurred. There remains a large, unknown area of unobserved past bleaching (possible “Type II errors” or “false negatives”). Th e spatial interpolation was an attempt to fill that gap. 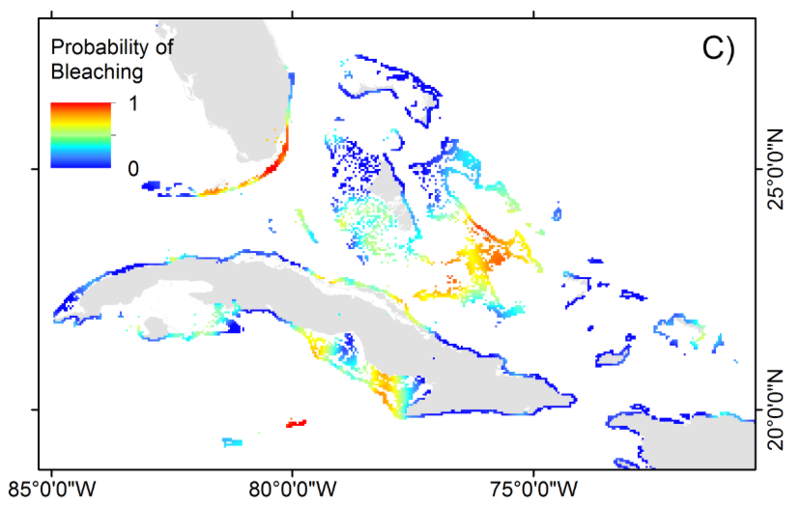 At left is an example of the before (top, observations only) and after (bottom, interpolation) from the Caribbean in 2005. The incredible warmth of the past two years laid waste to corals on the Great Barrier Reef. A new study, led by Terry Hughes and a large team of top Australian scientists, finds a strong correlation between the warm ocean temperatures over 2015/16 and the extent of coral bleaching, an often fatal paling of the colourful reef-building animals. 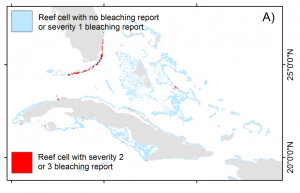 The study also finds that there are very few stretches of the Great Barrier Reef left (<10%) that were not affected by the 3 large-scale bleaching events over the past 20 years. 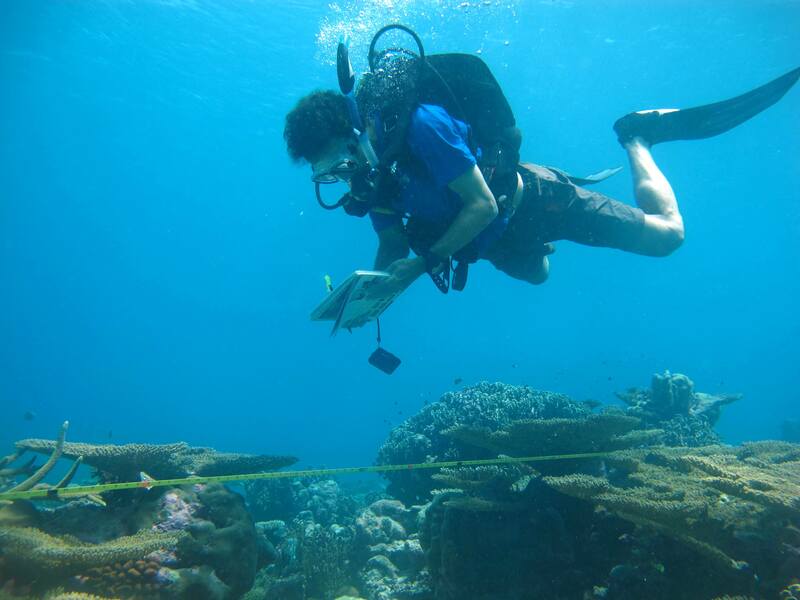 Securing a future for coral reefs, including intensively managed ones such as the Great Barrier Reef, ultimately requires urgent and rapid action to reduce global warming. 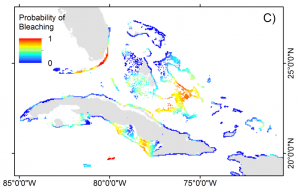 I wish I could say that this widespread death of corals comes as a surprise. It doesn’t. Scientific research, including my own, has been warning for almost two decades that the fate of the world’s coral reefs depends on actions to slow global warming. A look back at some old work on the subject shows just how critical a time this is for the climate, for coral reefs, and for scientists. The green dots around the central Great Barrier Reef represent a bleaching-level heat stress occurring every 3-5 years. The orange dots around the northern Great Barrier Reef represent bleaching-level heat stress at least every 2 years, far too rapidly for many coral reefs to recover. Fast-forward another 20 years to the 2050s, and all of the Great Barrier Reef, as well as 98% of the rest of the world’s reefs, appear in red: bleaching-level heat stress happening every year. To ensure the world’s coral reefs are protected from climate change, the margin for error on emission controls may be small. That statement rings true today, in more ways than one. When we finished the final draft of the paper, we realized that the higher-ups, who had to approve of work co-authored by NOAA researchers, were likely to object to the policy-tinged language in the conclusion. What to do? Changing a conclusion that flowed logically from the results was out of the question; even if we were open to a change, it seemed crazy to bend a scientific paper to suit the U.S. government when the lead author was not a government employee, let alone even an American. Instead, we massaged the author list and the author information to avoid crediting NOAA and a political review of the work. One NOAA person involved in the project, albeit very peripherally, offered to not be listed as an author. It has always bothered me. Today, the story of publishing that paper sounds almost quaint. The ‘war’ on science of the Bush years now looks like a minor skirmish compared to the nuclear holocaust of funding cuts, denialism, and obstructionism being pushed by the Trump Administration. And it is happening at the same time when scientists are pondering funeral arrangements for one of the natural wonders of the world, and pointing the finger at climate change. There’s no sense wondering anymore if it is appropriate for scientists to speak up and be heard. We should be shouting from the rooftops. Seriously, if not now, when? According to Bloomberg News, finance ministers of the G20 countries are pushing for a focus on private rather than public funds to meet the climate change financing pledges set in the Paris Climate Agreement. This report points to the most significant way in which the Trump presidency is compromising global momentum in fighting climate change. The provision of climate “aid” to the developing world is arguably the most contentious aspect of international climate policy. While the developed world did agree to provide at least $100 billion/year in climate financing to the developing world by the year 2020, there is no clear consensus on who is giving and receiving, what type of funding counts, or how ‘climate’ funds differs from other forms of aid and investment. The world has made far more progress in defining the terms and targets for emissions reductions than for climate financing. The type of funding is the largest area of disagreement. Developing countries have pushed for the majority of the funding to flow from public coffers, effectively as an add-on to international aid. That means funding would come directly from aid agencies or be funneled through international organizations like the World Bank and the new Green Climate Fund. The developed world, which already struggles to meet international aid promises, has never been strongly committed to the provision of public climate funds. Many countries, including the U.S. and Canada, have argued for a greater reliance on private investment. Even if that is not always stated publicly, it is clear in the negotiations and if you dig into the actual numbers. For example, the widely praised financing pledge made by Canada’s Liberal government shortly after the election amounts to ~$800 million/year through 2021. However, Canada’s fair share of the $100 billion/year pie is roughly $4 – 5 billion/year (based on fraction of developed world population or emissions). The shortfall is expected to be met largely via private investment. Enter President Trump. When the Trump administration announced it would cut support for the Green Climate Fund and all other international climate aid, it provided political cover to other developed (and rapidly industrializing) countries to cry poor about public climate aid. It is, in that sense, not surprising to see the G20 ask that the multilateral aid organizations look to raise funds from private sources. Does it matter whether climate financing is public or private? To be fair, there are legitimate arguments for a focus on private funding. For one, it may be more politically realistic. Yet, in the end, what is most important is not the source of the money, rather whether it is effective at helping the developing world respond to climate change. And that’s where a heavy reliance on private investment is concerning. It is hard enough to identify whether a given aid project would have happened under business-as-usual (i.e., the project is “additional” to aid that would have happened without the climate policy); it is even harder to do so with private investment. With a focus on private sources, there is likely to be more disagreement about levels of climate financing from donor countries and more gaming of the accounting system. Even more concerning is that private financing is less likely to go towards climate change adaptation and reducing disaster risk. If you include all forms of investment and financial flows in accounting of climate financing, adaptation gets the short straw. According to a 2015 report, only 10-12% of all the public and private ‘climate’ financing in 2013 and 2014 went from the developed world to the developing world, and only 1% supported adaptation in the developing world. Unless incentives are put in place, a greater focus on private financing will likely mean a lesser focus on helping developing countries deal with the impacts of climate change. The UN climate negotiations work by consensus. In the negotiating sessions, diplomats review the text of proposed policies in excruciating detail. It is normal to spend an hour discussing the suitability of the word “encourage” vs. “ask” in a particular sentence. The negotiations, though painful at times to watch, are very civil. They have to be: the end goal is an agreement with which every party is comfortable. Vitriol rarely paves a path to consensus. Contrast this with the current state of politics and governance in countries like the U.S. and Canada. Decisions are often reached by majority-rule. If one party captures 50% plus one of the vote – or of the electoral college – that party can make decisions with little concern for the minority position. In a multi-party parliamentary system like Canada’s, 40% of the vote is often sufficient to win a majority and make 100% of the decisions. Governments in majority-rule systems can carefully consider and respect the views of minority parties. However, there is often little incentive today to do so. That means there’s also little incentive for the opposition to be reasonable. If the only way to significantly influence policy is to defeat or embarrass the government, then you may as well oppose or obstruct any policy the governing party proposes just in order to get a “win” in the eye of your supporters. The outcome is childish political theatre and name-calling. Governing by consensus certainly has limitations. It allows an unreasonable minority to block progress. It leads to conservative decisions which are insufficient to address challenging long-term issues or the concerns of rightfully aggrieved minorities. This is a key criticism of the Intergovernmental Panel on Climate Change (IPCC): the requirement to reach consensus leads to arguably insufficient attention to lower probability but higher risk impacts of climate change. Still, imagine how different the reaction to Trump’s electoral college win would be in a rule by consensus system. There would be some comfort in the knowledge that minority voices will be considered in all decisions, rather than the panic that the party which eked out a narrow victory can completely undo policies supported by the opposition (and, in many cases, the majority of the population!). The process itself would also be far more respectful. The UN climate negotiations may be too slow and too ineffective. Yet unlike the political process in North America, you would not be ashamed to let your children watch. 1. Trump-ing Trump. After more than a week here at the negotiations, I can say with confidence that, yes, the President-elect may loathe the Paris Climate Agreement but not nearly as much as the people who negotiated the Paris Climate Agreement loathe the President-elect. 2. Find it difficult to work the day after the U.S. election? Feel for the Islamic American climate activist who had to speak at the interfaith climate dialogue a few hours after the election results became official. 3. Transparency efforts can be opaque. A key focus of the negotiations is developing a transparent reporting framework for parties to the Paris Climate Agreement. Between the constant evolving schedule, the last minute closing of previously open sessions to observers, and the UNFCCC website’s Byzantine document filing system, progress on the transparency framework has been anything but transparent. The UNFCCC needs my wife, a professional organizer, a heck of a lot more than it needs me. 4. Caffeine as an alternative fuel. All conference, there has been a steady stream of delegates from around the world feigning interest in the United Arab Emirates displays in order to grab a precious free cup of coffee or tea. 5. Here comes the sun. That same United Arab Emirates has a diorama of a massive 5GW solar farm in the works – including rows of PV cells, concentrated solar plants, a battery system, and new transmission lines – sufficient to provide about a quarter of Dubai’s electricity. It is just one of the many incredible solar projects on display here. The host country of Morocco itself committed to getting more than half its power from solar and other renewables by 2030. 6. Oh, the modalities. I appreciate the importance of developing clear communication procedures and of proper legal language, but good lord, if I hear the word modalities again, I might strangle someone.